The Impressionists developed one of the most innovative movements in the history of Western art. Their revolutionary ideas about light and colour, expression, realism, the aim of painting and the role of the artist, all laid the foundations of modern art. Although ridiculed at first by the art establishment in Europe, Impressionism became one of the most celebrated and popular of art styles, and artists such as Monet, Manet, Pissarro and Renoir have achieved enduring acclaim. Unlike the earlier Realists, Impressionists focused more on the way in which light impacted the landscape at a particular moment in time rather than creating a faithful representation of a static scene. Their techniques, subjects and color palettes would came into conflict with accepted parameters for art during their era, necessitating a break from the restrictive control of institutions such as LAcadrmie des Beaux-Arts, which had traditionally set the standards in the Paris art world. Developing in Paris in the 1860s, its influence spread throughout Europe and eventually the United States. Its originators were artists who rejected the official, government-sanctioned exhibitions, or salons, and were consequently shunned by powerful academic art institutions. In turning away from the fine finish and detail to which most artists of their day aspired, the Impressionists aimed to capture the momentary, sensory effect of a scene - the impression objects made on the eye in a fleeting instant. To achieve this effect, many Impressionist artists moved from the studio to the streets and countryside, painting en plein air. Several students at the Paris studio of Charles Gleyre would be instrumental in determining the future direction of art. Monet, Renoir, Sisley and Frederique Bazille, who would die at the age of 21, all studied under the Swiss painter Gleyre at LAcadrmie in the 1860s. They frequently ventured into the surrounding countryside to paint "en plein air," a practice not unknown to artists that had come before. However, contrary to the custom of earlier Realists, who would make preliminary sketches they would later perfect in the studio, these young artists transferred the scenes around them immediately to the canvas, catching the momentary quality of light with quick, sure strokes that contained none of the careful blending and precise refinement of Realist masters such as Gustave Corbet. In addition, they eschewed the hackneyed religious and historic subjects of the Realists, preferring to paint natural landscapes and lively, impromptu scenes such as "Luncheon on the Grass," by Edouard Manet. They also adopted the brighter pigments that were new to their era. Monet had become acquainted with Manet at the Louvre where many young artists would go to study the works of the masters. At Cafe Guerbois, a local artists' meeting place, Monet and his friends met other like-minded young painters such as Paul Cezanne and Camille Pissarro. As was customary for artists who wanted public recognition, many of them submitted entries to the prestigious annual Salon de Paris. Upon having many of these rejected, including Manet's "Luncheon on the Grass," the artists, now joined by Edgar Degas and Berthe Morisot, organized their own arts cooperative, which they christened the "Societe Anonyme Cooperative des Artistes Peintres, Sculpteurs, Graveurs." Their first independent exhibit opened in April 1874. 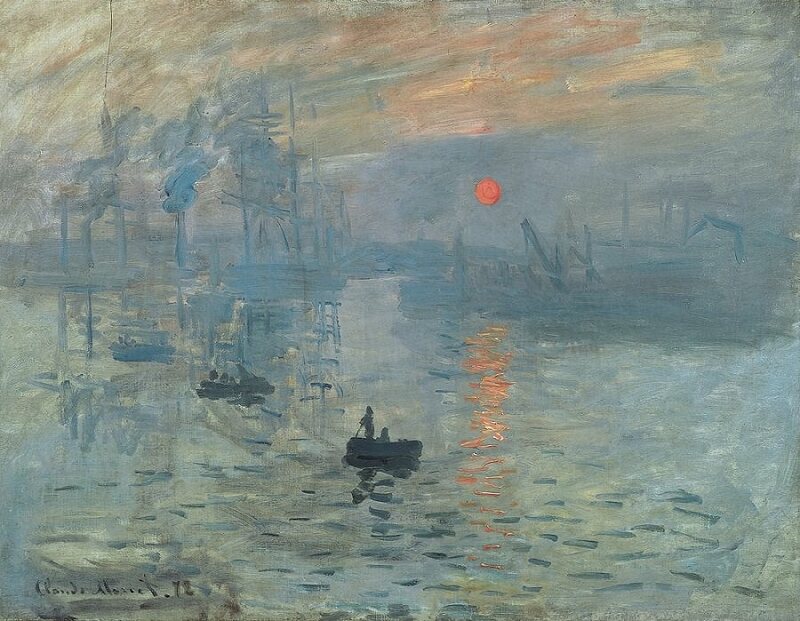 It was Monet's painting "Impression, Sunrise" that inspired the art critic Louis Leroy to dub the new movement Impressionism, stating sarcastically that the paintings on display were little more than unskilled sketches. Many in the mainstream concurred, but those few who looked closer were intrigued. As the annual exhibit continued over the years, the artists gradually gained credibility and began to garner more positive reviews. Camille Pissarro was a unifying force in the Impressionist movement. As the oldest of the group, he had studied in his earlier years with Realist Corbet. Later, he would mentor post-Impressionists Paul Gauguin, Vincent Van Gogh, Cezanne and Georges Seurat. For the group's premier exhibit in 1874, he entered five artworks, including "Hoar Frost, the Old Road to Ennery, Pointoise," a well-balanced composition portraying a farmer working in fields of brown and green. The artist preferred natural rural landscapes but also excelled in urban scenes, such as that of his Montmartre series of 1897. Manet was a transitional figure in the Paris art scene of the mid and latter 1800s, grounded as a student in Realism but later embracing Impressionist techniques. Along with "The Luncheon on the Grass," his painting "Olympia" heralded the infancy of modern art. While he felt an affinity to such artists as Morisot and Monet, he maintained his separate identity as an independent painter rather than considering himself a devotee of Impressionism. The most well-known works of Claude Monet are those he painted later in his life of the lily pond at Giverny. Chief among his contributions is his insight that the amount and quality of light changes the appearance of the same landscape. His early use of decisive brush strokes in such paintings as "Woman with a Parasol," done in 1875, exemplifies the artist's mastery of shadow and light while his vibrant palette shocked the traditionalist art community. He created between 250 and 300 Water Lilies paintings at various times of day and with varying palettes. He also created other notable series capturing different views of the same scenes, such as his Haystacks, the Ice Drift series and his paintings of the Rouen Cathedral. His use of unblended colors, his preference for light-toned backgrounds and his focus on the effects of natural light epitomize the key aspects of Impressionist art. Renoir joined his friends in the first Anonyme exhibition with six of his paintings. He entered two of his 1876 works in the third exhibition. These works, "The Swing" and "Dance at Le Moulin de la Gallette" are replete with energy and dappled with light. More of a traditionalist than some of his Impressionist colleagues, Renoir believed that composition and structure were important principles that should not be discarded. He also excelled at painting lively scenes of everyday life, and many of his canvases appeared in the Salon de Paris. When working side-by-side with Monet in 1869, painting the fashionable crowd at a popular swimming spot, "La Grenouillere," Renoir's individual style and interpretation became apparent. His use of light and color draws the eye to the group of revelers at the center of the canvas, while Monet's perspective and use of light draws the eye to the water and beyond to the farther shore, with the people on the island indistinct and secondary to the landscape. A devotee of the plein air method, Sisley was a landscape specialist who painted scenes of bridges, both along the Seine in Paris and the Thames in London, as well as seascapes and the countryside surrounding his rural home. In style and technique, he most resembled his colleague Monet, but the colors he often favored were more subdued. The clarity of light in such paintings as "Garden Path in Louveciennes" from 1873 and "Flood at Port-Marley" from 1876 is remarkable. Degas was a classically trained artist who was active in the Anonyme group, helping to organize exhibits and showing his work in all but one of them. However, he considered himself as an independent rather than an Impressionist, and differed from his colleagues in preferring to work indoors. Perhaps best known for his paintings of ballet dancers, including "The Dance Class" of the 1870s, Degas was also an accomplished sculptor. His detailed focus on the human figure in the many street scenes he painted set him apart from other masters of the era. He often depicted his subjects in awkward positions that challenged the idealized standards of earlier artists. Paul Cezanne found a mentor in Pissarro when he first came to Paris in the 1860s, and the two often painted together in the countryside. Cezanne shared Renoir's belief that paintings should have formal structure and strove to ensure that each component of his scenes was integral to their overall composition, reflecting the harmony of the natural world. The artist also went beyond the precepts of other Impressionists in his view of objects as geometric shapes, and his later works, such as "Mont-Sainte Victoire" and "The Large Bathers" from 1906, foreshadowed such 20th-century movements as Pablo Picasso's Cubism. Paul Gaugin was also a pivotal figure whose work, while rooted in Impressionist principles, ranged beyond them in terms of his innovative style. In the mid-1870s, Gauguin often visited Pissarro and they painted together in the older artist's garden. The artworks he produced in the 1880s, such as "Rouen at Spring" and "Red Roof by the Water," reflected the influences of Pissarro and Degas. Later, during his years in Tahiti, such works as "Woman with a Flower" from 1891 and "Primitive Tales" from 1902 illustrate his progression toward the fresh perspectives of Synthetism and Symbolism. Vincent van Gogh, while not a part of the core Impressionist group, was nevertheless a key figure in the movement who progressed beyond it during his relatively brief prolific period. He was a sometime friend of Gauguin, who shared quarters at Van Gogh's Yellow House in Arles for a few months in 1888. During this time, the two enjoyed a short-lived but productive period. Widely known for his Sunflowers series of paintings as well as his landscapes, Van Gogh's final paintings, such as "The Starry Night" of 1889, were unequivocally moving beyond the light-dappled immediacy of the Impressionist school toward the more visceral styles of Fauvism and Expressionism. The founding Impressionists and Post-Impressionists brought a spontaneity to art that future movements would continue to celebrate, adding their own innovations and influences. Spanning a pivotal point between tradition and modernism, key figures such as Monet, Degas and Van Gogh helped bring about a change in focus from the objectivism of the Realists to a subjectivism that was stripped of the sentimental trappings of Romanticism. The work of the Impressionists made it possible for 20th century masters such as Pablo Picasso and Jackson Pollock to take their vision into previously unexplored landscapes.